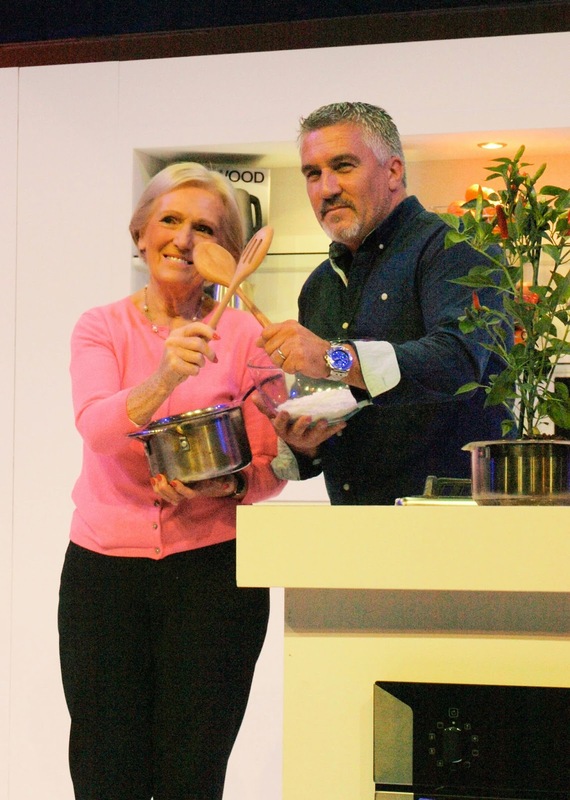 Mary Berry and Paul Hollywood were definitely the stars of the BBC Good Food Show Scotland this year. 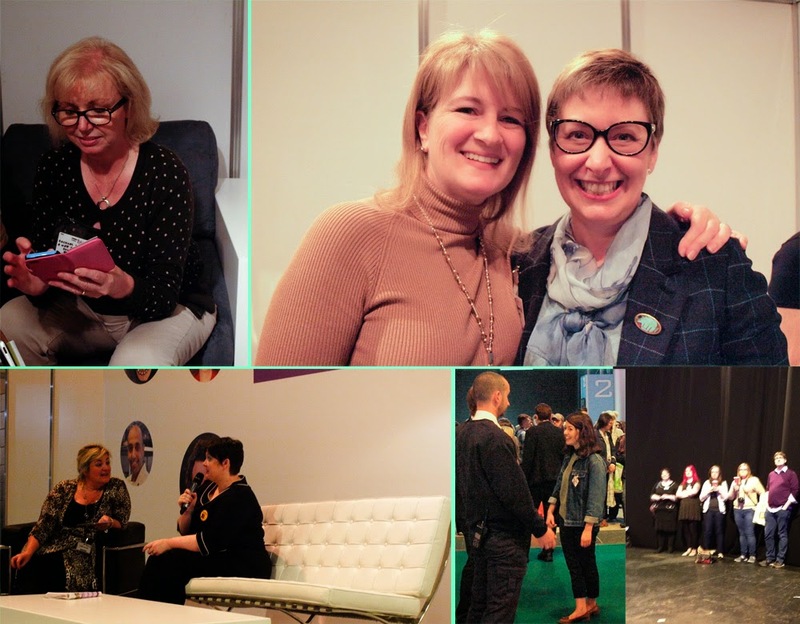 I attended the show on Friday 17th October, this was my first show in Scotland and the first time as a GFS Blogger, so let me tell you all about my experience. The show was opened by guess who? Yes, Mary and Paul stepped up with the giant scissors to cut the ribbon and start the show. 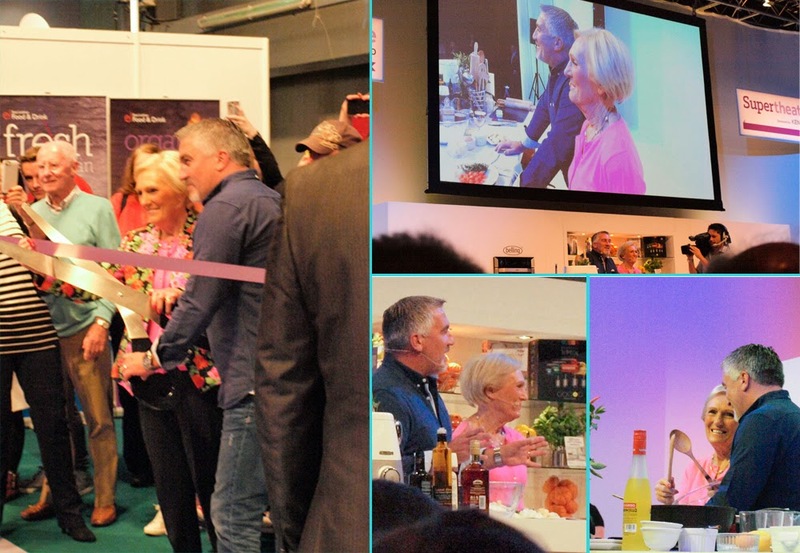 They were also first up at the Supertheatre where they entertained the packed theatre with great recipes and the kind of banter that you have come to expect from watching The Great British Bake Off and the spin off Masterclasses. I was super-impressed by the Showguide and Recipe Collection. Not only was it well laid out, with the floor plan and event timetables, featured right at the front, but it was also full of recipes featured in the shows and some extras too. There was a full A-Z listing of all the producers and a product guide which was also helpful. One of the real pleasures of the day was the chance to catch up with the other Good Good Show Bloggers. A special treat, and one of the main reasons I wanted to attend the show, was meeting Christina Conte of Christina's Cucina. Christina and I have been friends through Facebook but, although Christina is of Scottish/Italian descent she lives in California, so we had never met in person. 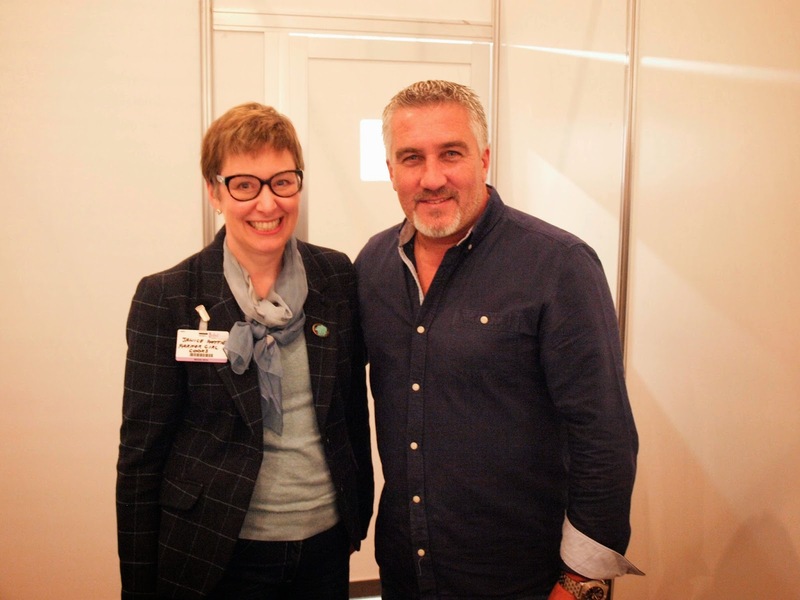 Christina was visiting the show as part of a series of events including the Scottish Baking Championships and The World Porridge Making Championships Speciality Award which she won with her Sticky Toffee Pudding Porridge. Other BBC Good Food Show Bloggers in attendance on Friday included Rachel from A wee pinch of sugar, Emma from Food and Drink Glasgow, Michelle from Ananyah, Paula from Get Stuffed, Julie from Breakfast at Julie's and Pam from Glasgow Food Geek. Just a few of the producers at the BBC Good Food Show, Scotland clockwise from the top left Heck Food (fabulous sausages which previously featured at Farmersgirl Kitchen in some chorizo burgers I made from a Nigel Slater recipe); local to me in the SW of Scotland, Waulkmill Cider from Langholm; Seed and Bean Chocolate from Cornwall and Award winning David's Chilli Oil. 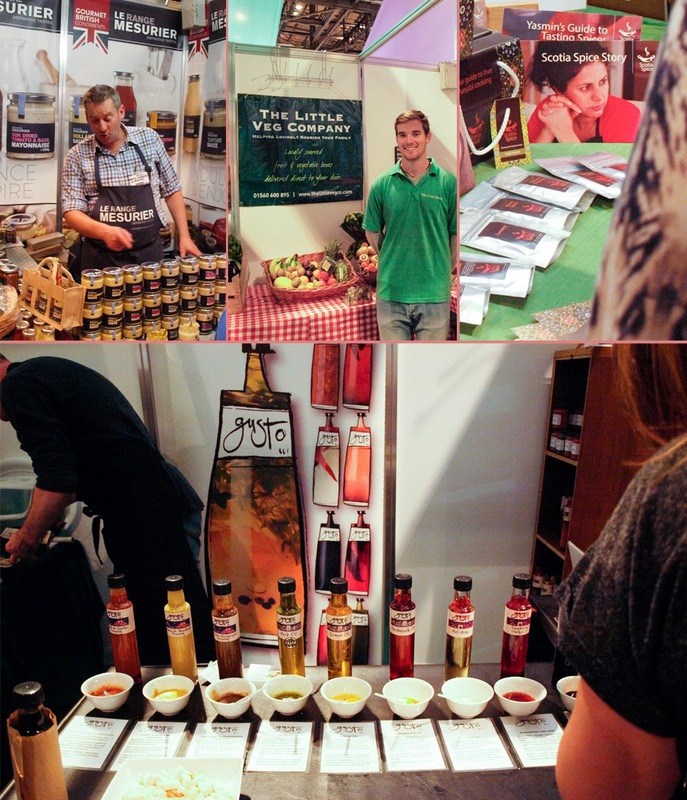 Across the top: sauces, mayonnaise, mutard chutney and relishes from Le Mesurier; The Little Veg Company, a veg box delivery company in Glasgow and the West of Scotland; Scotia Spice, authentic Punjabi Cookery School and Spice Kits and the bottom photo shows Gusto Artisan Foods purveyors of a wide range of oils and vinegars. 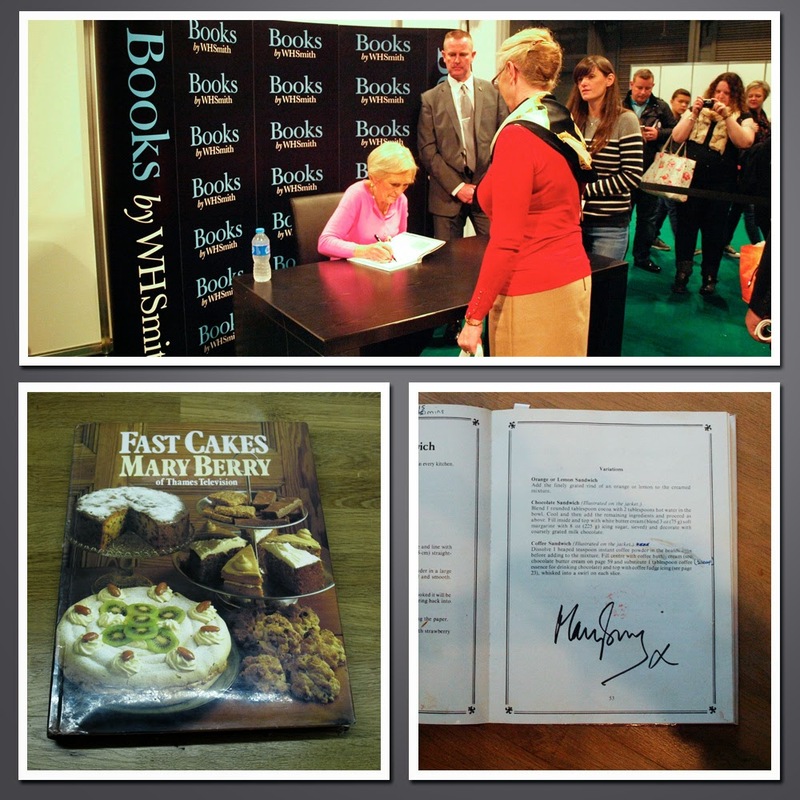 Once I knew I was going to the BBC Good Food Show, I was on a mission to get my 30+ year old Fast Cakes by Mary Berry signed by Queen Mary herself. Although I have been baking since I was a child, this is the book that really gave me confidence to bake and also the understanding of baking to allow me to experiment and create my own cakes and bakes. The rules for book signings are pretty strict and only certain books could be signed. I saw one poor girl who had stood for 30 minutes turned away because she had a Bake Off Book rather than a Mary Berry book. I bought Mary's latest book, Mary Berry Cooks the Perfect, to be signed and given as a gift (that's why I'm not showing it here) and slid my old, cake batter splattered and scribbled on book underneath. I was nervous as I approached the table, wondering if I would be refused the signature. However, I need not have worried, as I handed over the new book, I explained about Fast Cakes and there was no problem at all. Mary signed and gave me a big smile, then continued working her way through the long queue. After the 2.30 pm Supertheatre show, the bloggers had the opportunity to go back stage for a photo opportunity with Paul Hollywood. There was no opportunity to speak to Paul or to Mary, who was there only fleetingly, on her way to the Interview stage. I have to say I was hugely impressed by Mary Berry's stamina, she had few breaks and still looked fresh - she is the ultimate professional. Overall it was a great day out and I can thoroughly recommend it. 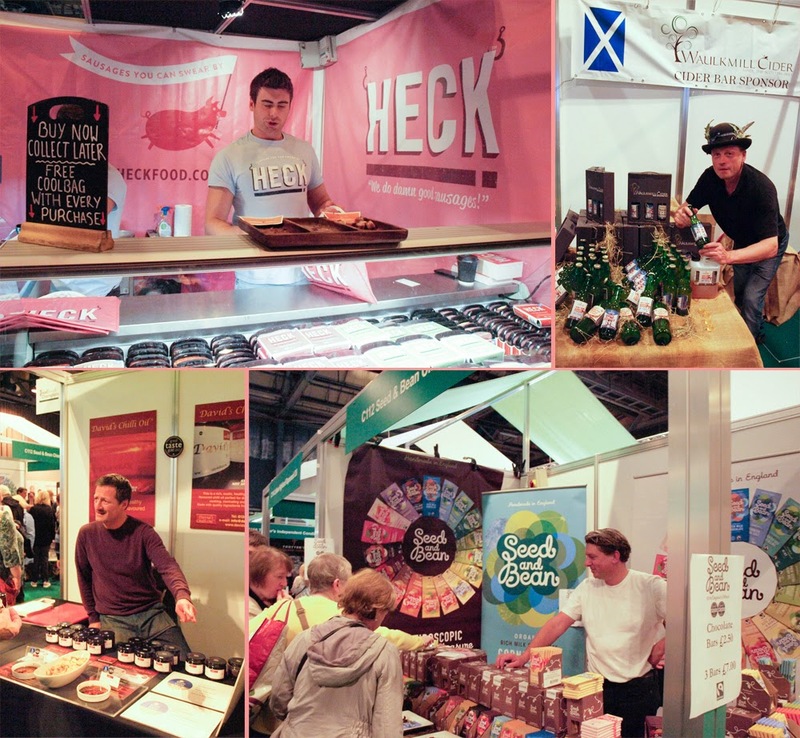 The Scottish show is over for this year, but there are still loads more BBC Good Food Shows that you can visit in the coming months. I had great fun there today! No signings for me though, although I did get to meet Christina too which was lovely! Glad you enjoyed it too and met Christina. Did you meet up with Mr Cakeyboi too? Sounds like another great experience Janice - you are doing well this year. How lovely to meet up with Christina - you've clarified what it is she's doing here now. I wondered how she'd managed to win the Porridge championships. You must have had a wonderful day. These fairs with amazing food are so easy to spend a fortune at. What was Paul Hollywood really like? look at the blank expression on the male judges face... were you goosing him? GREAT write up! Thank you. Yes, Christina has had a great year with lots of opportunities. Thanks Sisley. I resisted buying too much, particularly given the state of my house at the moment. We really only met Paul for a moment to have our photo taken, no chance to speak to him. How cool you got Mary to sign the book that inspired you. These shows are hard work to walk round but I do enjoy them!